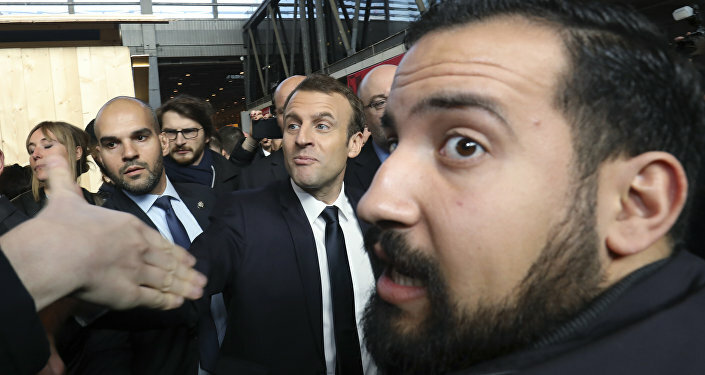 MOSCOW (Sputnik) - French President Emmanuel Macron’s former security aide, Alexandre Benalla, who was fired after having been caught on camera hitting a protester during a 2018 May Day rally in Paris, faced new charges on Wednesday over his selfie with a weapon, Le Parisien reported. According to the newspaper Le Parisien, a court in Paris has brought several charges, including that of "unauthorised possession of category B weapon", against 27-year-old Benalla. While he said he was posing with a water gun, the prosecution has rebutted this claim. A preliminary investigation into this case was opened last September when a selfie showing Benalla holding a gun leaked online. The photo was taken in the western French city of Poitiers during Macron's 2017 presidential campaign. A video capturing Benalla punching a young protester emerged in July 2018. He was promptly suspended from his duties and then sacked in August, with Macron qualifying his actions as "betrayal". The former security aide was charged with multiple offences, including violent acts, interfering in the work of public services, wearing an official insignia without authorisation, concealing video materials and breaching professional secrecy. Meanwhile, Benalla has said that he considered his actions during the rally as legitimate, claiming that he tried to help police officers confront offenders.